1 of 1 In a small bowl, whisk together lime juice, sugar, salt and the pepper. Slowly whisk in olive oil until blended. Stir in cilantro. 1 of 1 In medium bowl, combine pineapple, tomatoes, garlic and jalapeno. Stir in 2 tablespoons of the dressing. 1 of 1 Combine remaining dressing (about 1/3 cup) with the pork in a resealable plastic bag. Marinate in refrigerator about 15 minutes. Grill or broil pork about 6 minutes, turning, or until desired doneness. Slice into thin strips, and sprinkle with 1/4 teaspoon salt. Wrap tortillas in damp paper towels and microwave 1 minute. 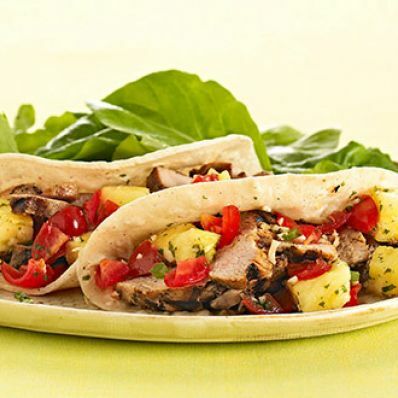 To serve, fill a warm tortilla with a few pork strips and some salsa, and fold up.